This easy to use load leveling device makes engine removal and installation a breeze. Angle of engine can be precisely changed with just a turn of the handle. The design allows the weight to travel back and forth on a special rod and bar supported by fixed brass rollers. The unit weighs only 14 pounds but is shop rated at a 1,200 pound capacity. 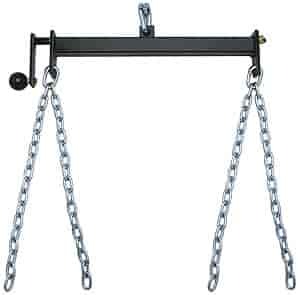 This fully assembled leveling device includes an upper lap link and four 20 inch chains. The Trans Dapt Performance Engine Tilter will save you valuable time and money. . Note: Four grade 8 bolts and large washers (sold separately) must be used to attach chains to the engine. Make sure that the device holding the tilter has a sufficient shop rating. 9099 - Trans Dapt Engine Tilter and Lift Plate is rated 4.7 out of 5 by 3. Rated 5 out of 5 by Mike 59 from Quality tool The tool adjusts very smoothly with the full weight hoisted up. Rated 5 out of 5 by elaboratebreakfast from Solid This is a nicely built piece of equipment. I used this to install a very heavy engine and transmission combination. When removing the old engine, I had a scary close call with a cheap leveler. It went right back to the store and I ordered this instead. Rated 4 out of 5 by DietMtDewman from worked Pulled a sbc with the tremec on it. Screw adjustment was smooth and removal was easy. Always have used a intake lift plate, this product makes removal/ install much easier. No complaints, would tell others to buy it.